More on the Arctic melt: the National Snow and Ice Data Centre updates its commentary on this year’s record ice minimum. As of yesterday, the five day moving average of ice was still moving downwards, but slowly. Their comment on the North West Passage is interesting. The main, deep channel of the Northwest Passage (Lancaster Sound to M’Clure Strait) has been open, or nearly ice-free, for about five weeks (since August 11, approximately). Of note is the northernmost ice edge ever recorded, at 85.5 degrees North, near the 160 degrees east longitude line. A whole day of rain within 150 km of the North Pole came somewhat as a surprise! For the past few weeks, one low-pressure system after another has continuously carried warm air from northern Siberia (15Â°C at the Lena estuary!) 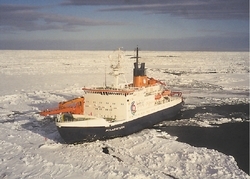 towards the central Arctic Ocean. 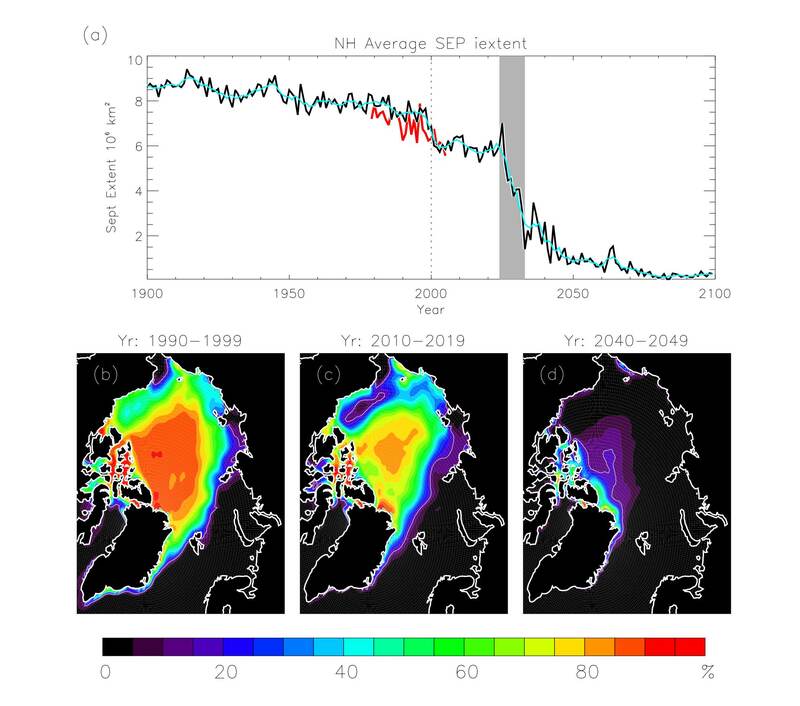 In this way the sea ice disintegrates more and more right before our eyes. It would be a bit more convincing if you would up it to Â£100! You’re dealing with an NZ writer, not an international global superstar like Flim-flam Flannery. Â£10 and a signed copy of Hot Topic, and a drink if you ever pass through Christchurch on the way South. I’m with Stoat and I’ll make a one-sided bet: if I lose I’ll track down some Alfajors Argentinian biscuits and send them down to you and if you lose … whatever. It’s just that even when trends are strong, records are rare things so betting on them is a mug’s game. I am now, and have always been, a mug punter. On the other hand, you should have look at the article by Cecilia Bitz at RealClimate where she discusses her paper on episodes of rapid ice loss in modelling… and we’re on two records in three years at the moment. Amazing, comparing the model runs discussed there to what’s happened since they published the paper. Notice that Holland et al show the NW passage as blocked pretty much until the bitter end. Also, Gareth, since William is basically betting on his own research being right I think you should seriously consider upping it. OT: NZ temps are getting a lot of attention over at Climate Audit just now. A Dr. Wratt of NIWA made the mistake of trying to engage them on the particulars. Very nice job with the blog, BTW. I’ll visit more often. As for my bet with William, what makes you think I can afford more than Â£10? In any event, he’s an Antarctic guy, and the ice down here isn’t melting. The bet is just for the Arctic. Also see this late-breaking news. I’m starting to feel guilty, though. This time for sure. It leads in turn to an NYT story in which William’s colleagues lean heavily toward a new low next year. IMHO the Australian drought/dominant El Nino situation has much in common with what seems to be about to get a lot worse in the Western U.S. Speaking of AGW in Oz, it looks as if your efforts may have inspired CSIRO. Steve: blogged on the front page. Last night (my time). Winter’s here (or there, in the case of the N Pole) and the temperature anomaly is around +20C. It’s still below freezing though, so the ice extent is still increasing – in fact, it’s slightly more than this time last year, so there’s been some bounce back. I’d suspect, however, that the new ice is thinner than usual, and will melt very fast in the spring. I think I’m still in with a good chance. That anomaly chart looks like it might need smoothing to have any real value, the anomaly for the 6/12 looks smaller than that which I remember from the 3/12. Variations around the long term trend as a result of changes in things such as occilations in ocean currents are expected, such variations are what Gareth and stoat’s bet is all about.